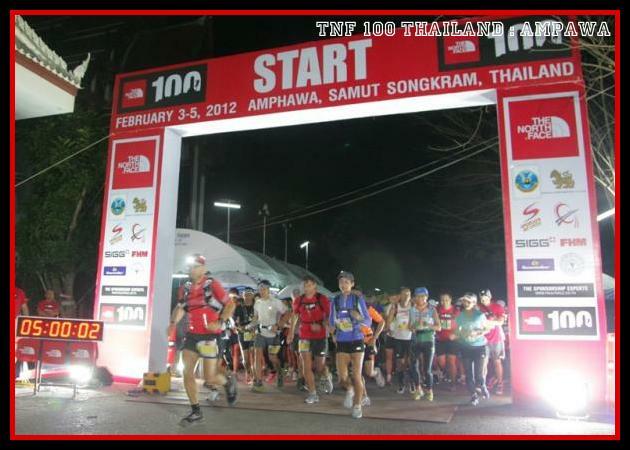 The inaugural running of The North Face 100km Thailand began on a muggy February morning in southern Thailand. About a hundred people lined up for a 100km solo, 50km solo, and a 50km “duo” division where teams of two run together racing for the lowest combined time. A 25km and a 10km race were held as well. The course for the 100km consisted of two loops of a 50km course which was approximately 70% road and 30% dirt road. Winding through villages, coconut groves, banana plantations, and some pomelo farms the course was completely flat. Five check points along the way allowed us to have a drop bag of personal stuff and food at each checkpoint. This was very good news in light of the fact that the race only provided water, electrolyte beverage, watermelon, and banana and best of all, ice-cold sponges! Honestly, I expected more from a top-name sponsor, but the aid station staff were helpful. Knowing that it is an all-too-common downfall of ultra runners to start too fast, I paid close attention to my pace. It is more difficult than you think to run slow, especially when you are well-rested, and the course is flat. I dialed into a 10:00/mile pace and felt like I could run all day – at least that was my plan! I knew I could potentially have a great race, but a couple of factors could count against it. Although a flat course lends to faster times, if one hasn’t been training on a strictly flat surfaces, the monotonous use of the same leg muscles could cause premature fatigue. I train on some flat surfaces, but I prefer the hills because they are more interesting and it makes me stronger – but it’s not necessarily the best training scheme for a long flat race. The other factor was the heat and humidity, as temperatures were expected to reach the mid-90s. Northern Thailand, where I’ve been training, has a different climate than the south and so the heat was definitely a factor. So how does it feel to run 100km? It doesn’t feel great the whole time, but it is not as bad as you think! About 2/3 into the race, I started experiencing a problem about protein. I was feeling so tired and keep feeling like I wanted and needed to walk, but when I checked my pace and splits, I was still not too far off. I did start to walk more, but when I was running, my pace was still not so bad and my legs seemed like they were not as tired as I was thinking. The muscles and the brain work on sugar, but in endurance events, your body uses more branched chain amino acids, and the process of getting those into your cells causes an increase in tryptophan which prefers to go to the brain and make you sleepy. It then becomes a fight between your will and ability to keep running and your brain that is telling you to stop and rest. So the question is did I start to walk more because my brain was overriding my will and ability to run, or did I walk more because my legs were too tired to keep going? I think it was the former and this is what those nutrition experts were talking about. A-ha! The second question is of course: how do I prevent that from happening? Although I had done my homework on this and had eaten a half of a PB&J from my drop bag earlier, it was a struggle to choke one down a bit later, and then I just couldn’t do anymore. In fact, I just didn’t feel like eating anything in my drop bags during the second loop. I kept choking down warm, bruised bananas from the aid stations, and ran out of the gels I brought. I sucked down as much as the electrolyte beverage they provided as I could and sipped water spiked with electrolytes from my backpack. During the race I probably drank at least five liters of water, but it still took me a long time afterwards to get caught up on fluids. Then finally – I broke through the single digit mark and there was only a final 10km after the last aid station. I felt better – all I could think about is the faster I go the sooner I can stop! Sometimes when you are on a long training run you think to yourself, how am I ever going to run for more than twice this long? But after having done it a few times now, I know that I can!It’s all about “relentless forward progress”! I didn’t expect to win the race. At the registration the day before I learned there were only four women registered for the 100km solo – I didn’t know whether to feel relieved or pressured. At the last aid station of the first loop, I knew that I had the lead – I had run with one of my competitors for about five miles – she is a very sweet Thai Dentist – but I left her at about mile 20 and was pretty much alone for the rest of the race. The thing that surprised me was coming in 4th overall! WOW! I was tired and I hurt, but I felt ecstatic! Here is a link to the splits and final times of all the finishers. 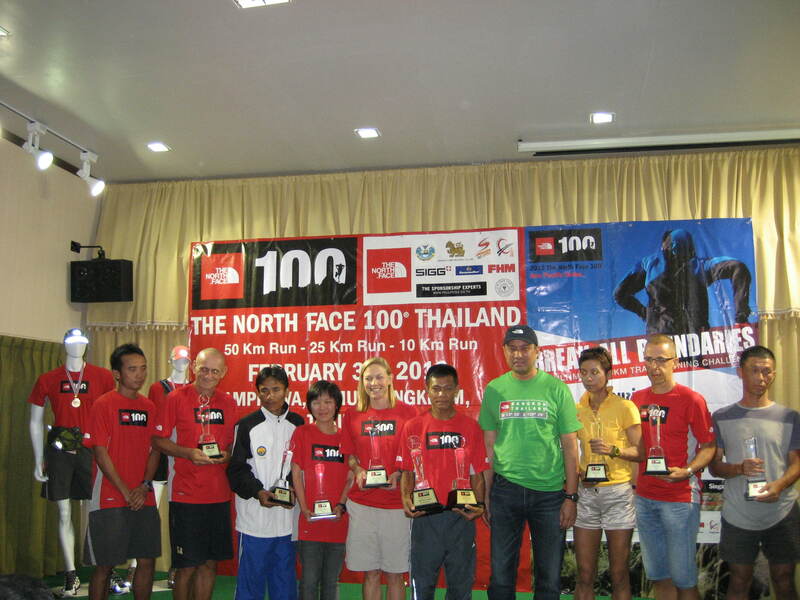 men and women winners at TNF Thailand! Yes, some of you have noticed the 80,000 Thai baht (about $2600) prize for first! It is actually a voucher to be spent only at The North Face in Thailand (very small stores), so it is not as great as cash. Still, I think I can find plenty to get for me and my friends as well! This week I have a busy week in Bangkok. I purposely planned it this week as Bangkok isn’t exactly the most runner-friendly place I know. Still, I managed to get out for and easy three miles yesterday morning. It so happened that a group of Kenyans were doing some easy paces in preparation for Sunday’s Bangkok marathon and so I joined them for a couple of laps! They asked me if I was running the marathon. I told them that I just finished a 100km race (they had seen the ads for the race) and they were duly impressed. Categories: adventure and sport | Tags: running, Thailand, The North Face, The North Face 100 Thailand, ultramarathon | Permalink.